We offer advanced network simulators including router/switch/terminal simulator. The simulators help in preparing for networking exams such as ccna or jncia. It would also be very helpful for those who want to get started with configuring Cisco® or Juniper® routers in a simulated environment. Several new features have been added to the current version, including Frame Relay commands, ISDN, sub-interface, and Access list configuration commands. We offer world's most advanced Cisco® Exam Simulators, which include several question types such as multiple choice single answer, multiple choice multiple answers, exhibit, Simlets, Testlets, Simulations and Drag-n-Drop questions for thorough preparation. All the questions are prepared according to latest objectives. We provide learn mode to understand the topics with flash cards and explanations and Exam mode, which simulate actual exam environment with time limits. We also provide options to save and review results. We offer CompTIA® Exam Simulators with multiple choice, exhibit and Drag and Drop questions for thorough preparation. All the questions are prepared according to latest objectives. We provide learn mode to understand the topics with flash cards and explanations and Exam mode, which simulate actual exam environment with time limits. We also provide options to save and review results. Lab Simulator for CompTIA® Network+ provides hands-on experience for candidates intending to prepare for Network+ certification. The software comes with several ready-made labs so that users can get acquainted with the simulator and its functionalities. The Lab Simulator offers advanced AP/rRuter/Sswitch network simulator functionalities including VLANs, VTP, interVLAn communications. We offer Exam Simulators for Microsoft® certification exams including MCSA and MCSE exams. We will be coming with some more practice exams in this section very soon keep looking this space for any updates. CertExams.com CCNA Exam simulator is available with 425+ questions. The exam sim distiguishes itself from others by providing Simlet, testlet, and router simulation type questions. This will provide true exam environment and prepare the candidate for taking the exam. 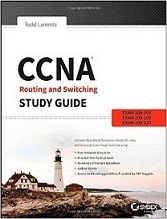 CCNA 200-120 Official Cert Guide Library is a comprehensive review and package for the latest CCNA exams. The two books contained in this package, CCENT / CCNA ICND1 100-101 Official Cert Guide and CCNA ICND2 200-101 Official Cert Guide, present complete reviews and a more challenging and realistic preparation experience. 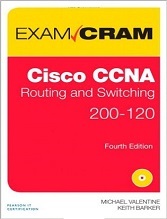 The books have been fully updated to refresh the content for the latest CCNA exam topics and enhance certain key topics that are critical for exam success. The guide summarizes all CCNA certification-level Cisco IOS® Software commands, keywords, command arguments, and associated prompts, providing you with tips and examples of how to apply the commands to real-world scenarios. Configuration examples throughout the book provide you with a better understanding of how these commands are used in simple network designs. 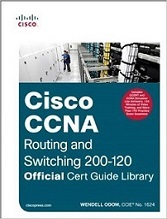 This book has been completely updated to cover topics in the ICND1 100-101, ICND2 200-101, and CCNA 200-120 exams. 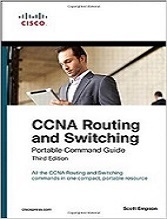 Use this quick reference resource to help you memorize commands and concepts as you work to pass the CCNA Routing and Switching certification exam. This all-purpose CCNA study guide methodically covers all the objectives of the ICND1 (100-101) and ICND2 (200-101) exams as well as providing additional insight for those taking CCNA Composite (200-120) exam. It thoroughly examines operation of IP data networks, LAN switching technologies, IP addressing (IPv4/IPv6), IP routing technologies, IP services, network device security, troubleshooting, and WAN technologies. The book is supported for free at in60days.com so just come over and register your copy to get free access to over $400 worth of videos, exams, cram guides and a friendly forum. 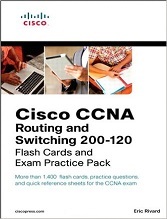 Covers the critical information you’ll need to know to score higher on your CCNA exam! Flash Cards: Review all exam topics with more than 750 flash cards in traditional print format in the book or in the Pearson IT Certification Cert Flash Card Online application that you can access via the Internet on your desktop or any tablet or smartphone. Select cards at random, or focus on individual topics. Build your own custom sets of cards to target topics of interest or difficulty. Enter notes on questions to help expand your knowledge. Grade questions correct or incorrect, and analyze performance reports to help understand your strengths and weaknesses. Practice Test: Practice with the powerful Pearson IT Certification Practice Test engine, complete with three full exams of realistic test questions. Take exams in study mode, which enables you to select question topics, check answers, review explanations, bookmark questions, and take notes; or take random, timed exams that simulate the actual exam experience. This assessment software offers you a wealth of customization options and reporting features, laying out a complete assessment of your knowledge to help you focus your study where it is needed most. Quick Reference Guide: Study with more than 190 graphical quick reference sheets that offer you a quick refresher of the key concepts for all exam objectives. Disclaimer: CertExams.com is neither associated nor affiliated with Cisco® systems or any other company. CCNA™ is trademarks of Cisco® Systems and duly acknowledged. The practice tests material is a copyright of CertExams.com and the same is not approved or endorsed by respective certifying bodies.